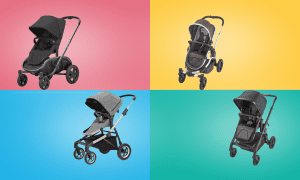 How To Buy The Best Pushchair Accessories - Which? Pushchairs can come with a surprising variety of accessories. So, from raincovers to footmuffs, we help you decide which ones you really need. Raincovers are essential for any pushchair that will venture into the great outdoors to keep the wind and rain off your child. Most pushchairs, apart from the cheapest buggies and some designer models, include a raincover in the price. If your pushchair doesn’t come with one, consider buying it separately. They usually cost up to £30. It's often wise to go for a raincover that's made specifically for your pushchair to ensure the best fit. Most pushchairs have a mesh or fabric shopping basket suspended under the seat. Vital for storing shopping or nappy bags, these can usually carry up to 2kg of everyday shopping items – up to 5kg for the biggest versions. Make sure your pushchair's shopping basket is easy to access – some pushchairs have shopping baskets that are hidden by bits of the chassis, fabric from the hood or the backrest when the seat is reclined. Never hang bags from the pushchair's handles - it's dangerous as it can tip the buggy up. Pushchairs with a hood can help protect your child from mild drizzle, bright sunlight shining in their eyes or blustery wind. Some pushchair hoods have windows in the top, so you can still keep an eye on your baby when the pushchair seat is facing forwards. Our pushchair testers like hood pockets, which provide handy extra storage, and there are now pushchairs with specific iPod pockets (and even speakers for your baby). If you know what type of pushchair you want, check out our pushchairs reviews. One of these can make wearing (or straining against) the pushchair's harness more comfortable for your baby. These bars, which hover across the front of the pushchair's seat, will give your child something to lean forward against. The bar should never be used to restrain your child in the pushchair, though. Some pushchair bumper bars include a tray where your child can store their bottle and favourite toy. Look for a bumper bar that unclips and swings out. This is easier to use than having to lift your child over it to get them in and out of the pushchair. Footmuffs, cosytoes or aprons can be worth considering if you're going to use your pushchair for long strolls in cold weather. This is useful for parents who want to use their buggy in summer and don't want to bother with the hood. It will keep the sun out of your baby's eyes, keep them cooler and help protect them from burning in the sun. Some pushchairs have cup holders and trays for parents, which can be useful for caffeine fiends or holding dropped dummies, but check that they're well designed and don’t get in your way. 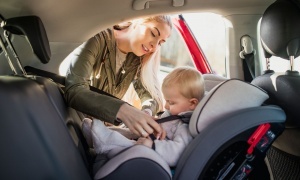 We think it's vital that you protect your child with the best car seat you can buy, so we don't test travel systems or pushchairs that will only work with car seats that do poorly in our tests – see our reviews of child car seats for current Best Buys. All the travel systems we've tested, many all-terrain pushchairs and a few strollers can be used with a car seat. In all cases it's easy to attach and detach the car seats from the frame. In some cases the car seat is included in the price of the pushchair. 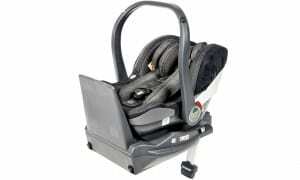 Visit our best car seats reviews. Some travel systems can also be used with carrycots – handy for getting your baby in and out of the pushchair when they're sleeping. Pram charms are decorative items some mums attach to their prams to hang from the bumper bar or hood. They are often made up of bows and beads with ribbons and crystals. Pram charms have become very popular in recent years and are often given as christening gifts or a present at a baby shower. But when it comes to hanging things from your pram or pushchair, for safety you should only hang toys that are specifically for children and have gone through stringent safety tests.